This was my first book in Elizabeth Zelvin's DEATH Series to read, but it was one that definitely makes me want to know more about the characters readers get a chance to meet. Zelvin gives us individuals who have learned to address their personal demons and now are in a position to not only help others but use their abilities to solve a crime or two in the process. Bruce Kohler and his friends find themselves in the middle of a mysterious set of circumstances while in the Hamptons, and it falls on them to figure out not only what is going on but who is not exactly what they appear to be. There are so many layers to this book that will draw readers of various genres in. There is the mystery that I mentioned, and those who like a little suspense and drama will appreciate that. There is also the complexities of not just Kohler and his friends Barbara and Jimmy but those they meet in the group house that will keep your attention. They are imperfect individuals trying to make the most of life, not always being able to succeed. 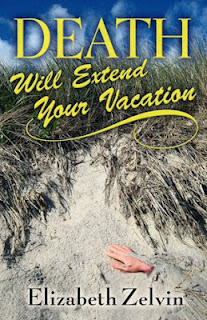 DEATH WILL EXTEND YOUR VACATION comes to life for the reader because of the way the author is able to draw you in with the storyline and the characters. Once you start reading it you will definitely be hooked, and what more could a reader want from a book! Find out more about Zelvin and her other work at www.elizabethzelvin.com.